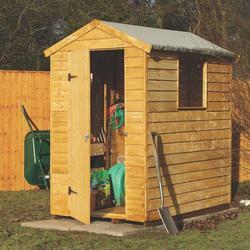 Garden Sheds come in many different styles and are built from just as many materials, from PVC to wood or metal. Ship-lap or feather edge, apex or flat roofed. The websites we link below have loads more on offer. Budget sheds start at less than £100 and they can go into the thousands depending on size and standard. 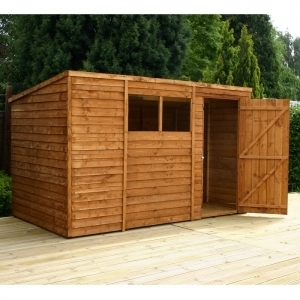 Standard 6 x 4 foot sheds are sold by most retailers of this nature - this one is below £150. The cost effective option. At around £380, the Nelson Overlap Pent Garden Shed at 3.12m x 1.79m in size, is an example of the next level of sheds and garden stores. They progress in size and price from this. 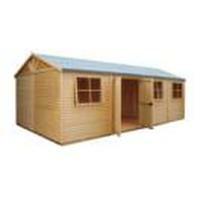 The Shire 12' x 24' Wooden Loglap Shed x Workshop is the ultimate in self construct shed / store buildings. At around £3,000 it works out cheaper than almost any other option, whether it be a garden building or garage. 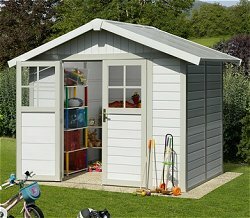 The Deco 5 2.63 x 1.78m PVC Garden Shed will last in better condition than any wooden structure. It has a neat and tidy design and can easily be used as a children's play house.